Climate Change Connection > Science > What was climate like in the past? In order to fully understand what is happening in our climate system today, it is important to look at what Earth’s climate was like in the past. Today, we are able to make observations about our climate using a variety of tools and instruments, such as thermometers or satellites. These tools were obviously not at our disposal thousands of years ago, so how is it possible to know what the climate was like in the distant past? 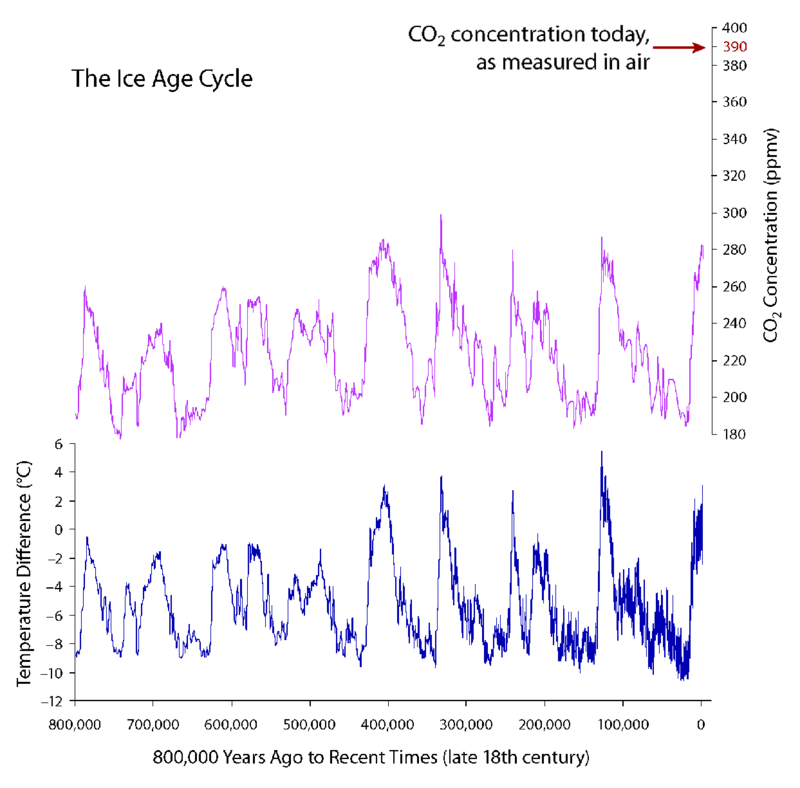 Ice cores provide a continuous record of the climate dating back hundreds of thousands of years. As snow fell in regions like Antarctica or Greenland, it didn’t melt in summer like it does here. It stayed and became compacted to form ice under the weight of new snow. Ice closer to the surface of these ice sheets are thus a snapshot of the more recent climate, while ice found deeper fell as snow a very long time ago. As ice forms, small bubbles of air are trapped within this ice. Scientists are able to analyze the composition of this air to measure things like the carbon dioxide or methane concentrations. This is how we are able to identify how much of these greenhouse gases were present in the atmosphere long before we were able to keep an instrumental record of this data. By analyzing the ice in these ice cores, we are able to reconstruct what the temperature was like long before we were able to measure it with thermometers. This is possible by analyzing the “heavy” isotopes of oxygen (18O) and hydrogen (deuterium) found in the ice. The ratios of these isotopes can tell us a lot about the temperature in the region at the time, as the process of evaporation and condensation of these heavy isotopes is affected by temperature. When the surface temperature is higher, more of these heavy substances evaporate, and thus are found in greater amounts in the resulting precipitation. A bigger ratio of 18O and deuterium is thus indicative of warmer temperatures in the region. The current CO2 level (now 400 ppm) exceeds anything in this record by a lot. The temperature graph sets a zero in the late 18th century. We have instrument data that shows about a 0.8°C increase since the late 1800s. Analyzing tree rings provides information about the climate from year to year in the region where the sample is extracted. Because climatic factors like temperature and precipitation affect tree growth, their influence can be seen in tree ring data. By extracting sediment cores from the ocean floor, it is possible to reconstruct the climate of the distant past. Fossilized plankton and other fossils provide information about what the temperature was like up to a million or so years ago. As with ice cores, this proxy thermometer is constructed by analyzing the ratio of isotopes found in fossilized sea life. The amount of 18O found in the fossils is an indicator of what the temperature was like at the time these fossils were formed. Boreholes are holes drilled into the earth, and temperatures are taken at varying depths. Because scientists understand the basic geothermal properties of the ground, it is possible to reconstruct what the temperature could have been based on what the recorded temperature currently is at specific depths below the surface. Because surface properties (vegetative cover, land use) can influence ground heating and cooling, it is important to include these factors into temperature reconstruction. A lot of information about various aspects of the past climate can be extracted from various records kept by people through history. Many settlers in various parts of the world kept written records and produced art detailing what the climate was like at that time in history. The Hudson Bay Archives are a Canadian example of historical records containing information about the climate at the time. These records can offer insight into temperature, precipitation and weather anomalies of the past, as recorded by people living in the area at that time.